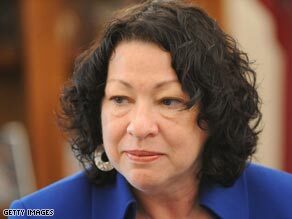 WASHINGTON (CNN) -- Supporters of Supreme Court nominee Judge Sonia Sotomayor Wednesday circulated a speech she made in 1994 that includes similar remarks to her 2001 "wise Latina" comments, which have drawn fire from conservatives as racially insensitive. Judge Sonia Sotomayor was confirmed as an appeals judge after senators were given her 1994 speech. In highlighting the earlier speech, Democrats are making the point that her GOP critics never complained before about the sentiment that judges with different backgrounds can reach different conclusions from the bench. While her earlier speech did not include the racial and ethnic references that appeared in her 2001 speech, it did include references to gender and the idea that a female judge would reach a "better" conclusion than a male because of her life experience. The March 17, 1994, speech to the Conference on Law Reviews was submitted to the Senate in 1997 when Sotomayor was nominated -- and ultimately confirmed with Republican support -- to be on the U.S. Court of Appeals. In it, she discussed the role of gender and referenced a quote attributed to Justice Sandra Day O'Connor that "a wise old man and a wise old woman reach the same conclusion." "I would hope that a wise woman with the richness of her experience would, more often than not, reach a better conclusion," she said in the 1994 speech. "What is better? I....hope that better will mean a more compassionate and caring conclusion." In the 2001 speech, she said, "I would hope that a wise Latina woman with the richness of her experience would more often than not reach a better conclusion than a white male who hasn't lived that life." A senior GOP aide responded Wednesday that the Democratic effort on the 1994 speech contradicts the White House claim now that Sotomayor simply had a "poor choice of words" in the 2001 speech.